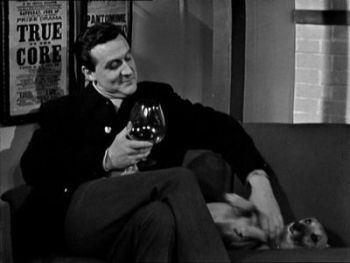 Steed's third dog, Sheba, was the real-life dog of Patrick Macnee's second wife, Kate Woodville.  In his autobiography Blind in One Ear, he mentioned a "mongrel whipped named Sheba" (229). It's more than obvious that she's not a film dog. 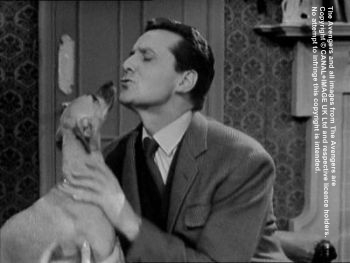 That little puppy really loves John Steed/Patrick Macnee, and so does he. She licks him all over his face, and he enjoys it very much. 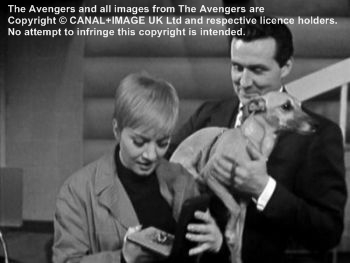 Sheba is Steed's dog in four The Avengers episodes: The Big Thinker,The White Dwarf, Man in the Mirror and Conspiracy of Silence. 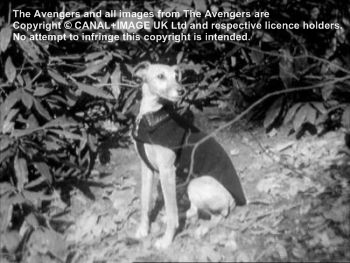 He walks her into the park and is playing with Sheba in the episode Conspiracy of Silence. 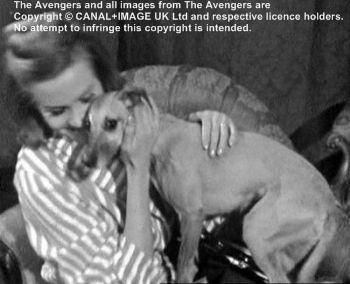 Mrs. Gale is also very fond of the dog because Sheba, unlike Freckles, is allowed to sit on Mrs. Gale's couch and she takes care of Steed's dog while he's on a mission in the Middle East. 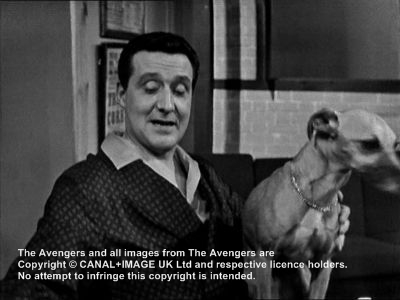 "You will be looked well after here, old girl" (The Big Thinker), Steed says to his dog and instructs Mrs. Gale to feed the puppy with "half a pound of raw meat...and a few biscuits daily". 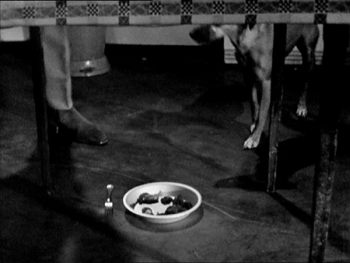 He's also feeding Sheba inside Mrs. Gale's flat in The Big Thinker. 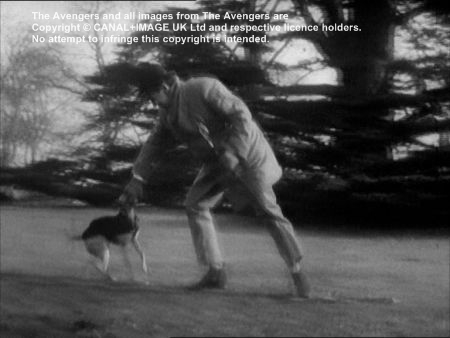 Venus Smith takes the dog for a walk to the funfair in Man in the Mirror, Venus and Steed go for a walk with the dog in the final scene of The Man in the Mirror.